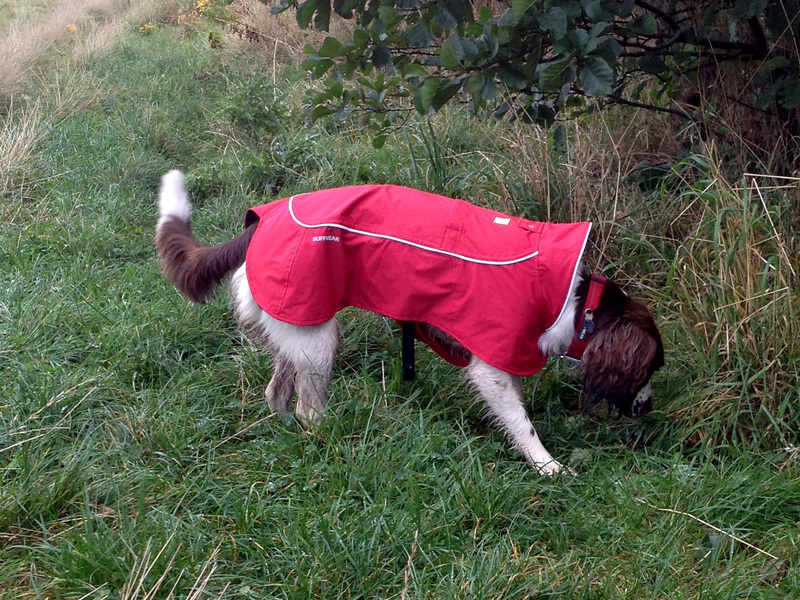 Neil Braidwood find this new waterproof jacket a great fit – for a dog. 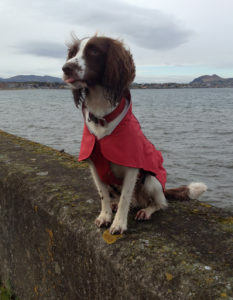 Our Springer Spaniel Ruby doesn't stay clean and dry on walks in the country or in the town. Dogs are pretty well adapted for bad weather, but sometimes they (and their owners) appreciate a wee bit of help. American outdoors company Ruffwear specialise in outdoor kit for your pooch, from leads and collars to mini saddlebags for longer hikes. The quality is very good, and all their products have some nifty features thrown in. 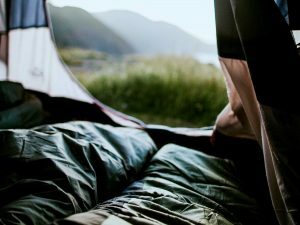 A lot of thought has gone into this rain jacket, so we decided to put it through its paces. Firstly, the feel of the material is good. 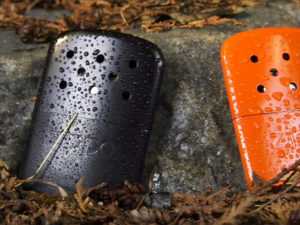 It's lightweight and flexible – just like you'd expect from a human rain jacket. The colour isn't too bright – ours was a russet red colour with a marl streak through it, so it's quite subtle, but still visible. There's reflective piping running down the length of the jacket on both sides, and a loop at the neck to attach a flashing light – or beacon – as Ruffwear likes to call them. I was sceptical that the jacket would fit Ruby – she has a long back, and she's from working stock so quite thin. Other rain jackets hadn't covered her completely, or had moved around when she was running. I had measured around her ribcage area to get the Ruffwear sizing, which turned out to be a small (sizes range from XXS-XL). To put the jacket on, you need to put the dog's head through the neck, and her front legs through holes at the side of the jacket. There's a fixed and clever flap which covers the chest and most of the underbelly of the dog, which most jackets don't think about. That's often the bit that comes back the dirtiest. This flap secures at either side via adjustable, concealed clips. They won't get snagged on anything, as they're hidden away. The length of the jacket was so perfect it was like it had been made to measure, even down to a notch at the back to allow for the tail! 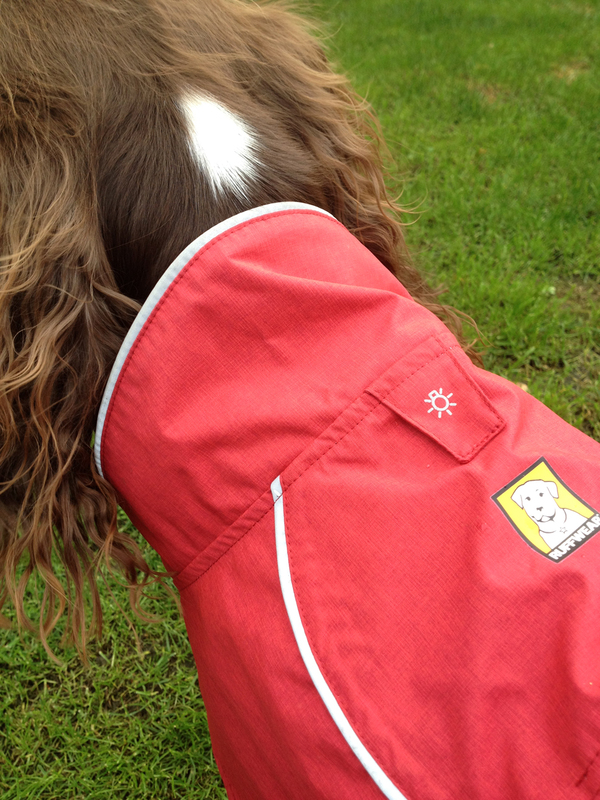 On windy days, you can use the elastic straps on the hind legs, to keep the jacket in place. There's a nifty (and fashionable) stand-up storm collar – I guess to keep wind off the dog's neck, but not sure how necessary this was. Lastly, if you already use a Ruffwear harness, which has a leash point behind the shoulder blades, then there is a slot on the back of the jacket, making it compatible. Ruby was more than happy to put the jacket on, and didn't even mind the elastic straps at the back. They looked a bit tight at first, and needed some adjustment when she was on the move, as they had a tendency to ride up a wee bit. She seemed fine with them though. They are useful in the wind, as the jacket can blow back and leave the back exposed. The jacket didn't impede Ruby's movement at all – she likes to run fast, and the lightweight nature of this jacket makes it perfect for active dogs like her. I liked the chest flap, as she's always bounding through long, wet grass, and the sides of the jacket come down quite low, which helps to keep these areas dry. In torrential rain, the jacket stands up quite well and kept Ruby remarkably dry. The water just beads off in shorter showers. It claims to be breathable, but until Ruby tells me otherwise, I had no real way of knowing. 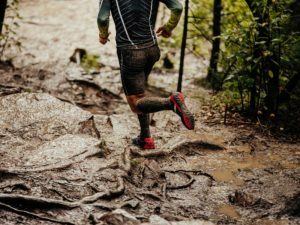 When wet, it dries out quickly, and it is washable in the machine if your dog has a tendency to roll in unmentionable stuff found along the trail. So I guess that's all dogs then. As the winter months approach, this decent wind and waterproof jacket is a good investment for you and your pet. Unless of course you like the smell of wet dog!